This has officially become my "Most Wanted" recipe! As always, I will be upfront and confess that the original creation of this recipe is not my doing. I found the base of the recipe somewhere else and I have altered it to fit my gluten free lifestyle and the palate of my 14 month old little girl. We have a hard time around here finding a really good "cracker" so I was excited to see a base recipe for this and use it to create something I have not been able to enjoy for almost four years, a Cheezit. They were so easy to make and so delicious! I'll just stop blabbing and post the recipe! I hope you enjoy as much as we did! -Note: Read recipe to see when to preheat your oven. Do not preheat at the beginning. Pulse flour and butter in a food processor until combined. Slowly pulse in cheese (1/2c at a time) until all is combined. Pulse in 1T of Ice water (without the ice) at a time until dough is not as crumbly Remove from food processor and place in plastic wrap. Wrap up tightly and place in the refrigerator for about thirty minutes. Once dough is out of the refrigerator, touch as little as possible. The warmth of your hands will start to melt the butter and we do not want that! Roll out dough onto a counter with a little bit of flour on it. Roll until dough is 1/8" thick. 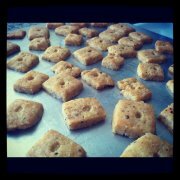 Cut the dough into small squares, about the size of Cheezits. I used a pizza cutter and it was fast and easy. Place squares on a greased cookie sheet. To keep the cracker from puffing up in the middle, I placed a small hole in the center of each square. I broke of one of the teeth off of a plastic fork and used the broken end (bigger end) to poke the holes. At this point, you can preheat your oven to 350 degrees. After you have placed all crackers on the baking sheet and poked holes in them, place the baking sheet in the refrigerator for ten minutes. This will cool down the butter again so that your crackers will stay square and not spread. Bake at 350 for 13-18 minutes (depending on your oven) and enjoy! **The non-Hadley version has a few extra ingredients. The next batch, I will be substituting Pepper Jack cheese for the Cheddar. What type of flour did you use? I'm new to the gluten free thing and learning about different flours and how to use/combine them is daunting!! Thanks! I just use Pamela's Pancake and Baking Mix. I make it work for whatever I am making. It is so much easier and cheaper than trying to combine flours, starches, xangthan gum, etc. OH! And after looking further in your site, thank-you to you and your daughter for your sacrifice and to your husband for his service! It is appreciated! Thank you, Julie! It's an honor to stand beside my man in uniform!! I just found your blog. I've been GF since 2006 a year after I got out of the Navy. I wish my docs had been able to figure our my issues before I got out, maybe I would have been able to maintain a healthier weight at the time. Hi! Thank you so much for your service!!! Unfortunately now days, Celiac or a Gluten Intolerance is a reason to be rejected by the military! We know someone who was actually Honorably Discharged for his diagnosis with Celiac! I am very glad you discovered your G issue!!! It is such a pain getting to that point!!! Good luck!!! I just found your blog through pinterest and began following! I have had celiac for 15 years now and am always looking for new recipes. I was wondering what GF flour you use? I love cup4cup flour, but it can be a little pricey. I use Pamela's Pancake and Baking Mix! I figure out a way to always make it work!!! It's easier and cheaper than trying to combine flours, starches, etc.! Thanks for following!!! I hope I can give you some ideas/inspiration for more recipes! Thank you for sharing. We are new to gluten free and my 6 year old is having a hard time without his beloved cheezits. I am going to make this tonight and he will be a happy boy. Please thank your husband for his service from us.